There's something about a handlebar throttle that makes me smile even if this EV has no "vroom." 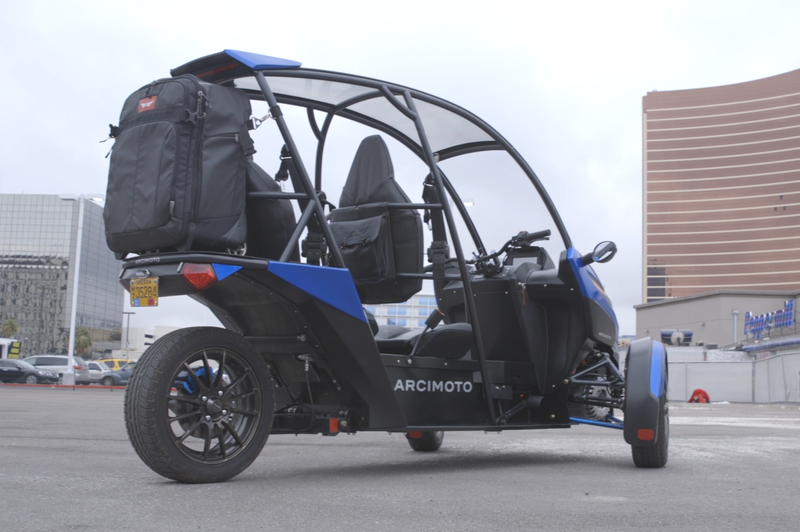 Arcimoto is bringing a whiff of motorcycle-y fun to the low-end EV market, and I hope the company embraces that. While its SRK prototype is no hot rod, the tactile experience of its handlebar throttle (just like a motorcycle’s or scooter’s) still gives me a thrill, even without the vroom. Arcimoto’s less flashy goal with the SRK is to create an EV that’s more affordable than an EV automobile. The SRK offers more room than a motorcycle (and the third wheel makes it easier to drive), yet it costs significantly less than a car—just $11,900 when it’s scheduled to start shipping at the end of the year. You can reserve a vehicle with a refundable $100 deposit. This personal-sized EV seats two, one behind the other, in lightly padded chairs with integrated seatbelts. Two wheels in front support the motor and the front passenger, and one more’s in back. A space frame surrounds the passenger area in Arcimoto’s SRK, offering front and side impact protection. The battery runs underneath the floor of the passenger area. The SRK’s range is about 70 miles, or 130 with an extender. The battery is expected to last about six years and can be replaced for about $2,500. Right now you charge only via Level 1 (standard household AC) or Level 2, but the company is considering adding DC fast-charging capabilities. You turn on the SRK with a key and toggle a switch on the right handlebar to move from forward to neutral to reverse. Once in gear, I rotated backward on the handle to move in the chosen direction, with the gratification of EV instant torque. The SRK’s top speed is about 85 mph, which I didn’t test in the controlled course, but I did get the rear tire to squeal as I tried a tight turn. 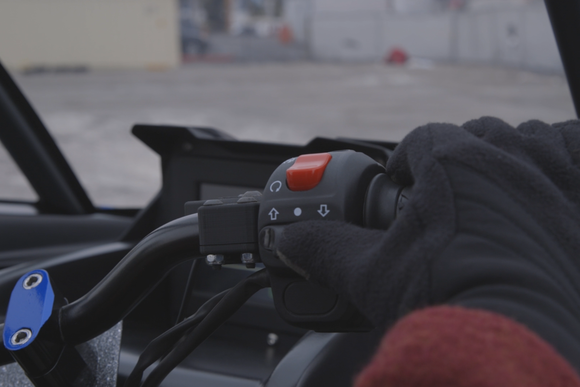 The Arcimoto SRK works like a motorcycle, with handlebar throttle. A simple toggle switch moves from forward to neutral to reverse. The ride feels stable even when a slight maniac is trying to see what it can do. The entire time, the vehicle is as quiet as any EV, which I find very restful. What isn’t necessarily restful is the exposure to the outdoors. The passenger area is protected by a spaceframe, designed to handle side impacts at hip level as well as front and rear hits. Just like on a scooter or motorcycle, though, you still get exposed to sun, wind, and rain, though a windshield and clear plastic roof protect you from the worst. You will be able to buy panels that sit onto the spaceframe, for a cost estimated to be less than $2,000. Like a similar personal transport vehicle I’ve driven, the Toyota iRoad, the Arcimoto SRK would work as a light errand runner or commuter for one or two people. The spaceframe feels sturdier than the shell on the iRoad, let alone on a standard motorcycle or bicycle, so that’s the main advantage I see. Oh, and the almost primal enjoyment of the handlebar throttle, which made me smile every time I started it. 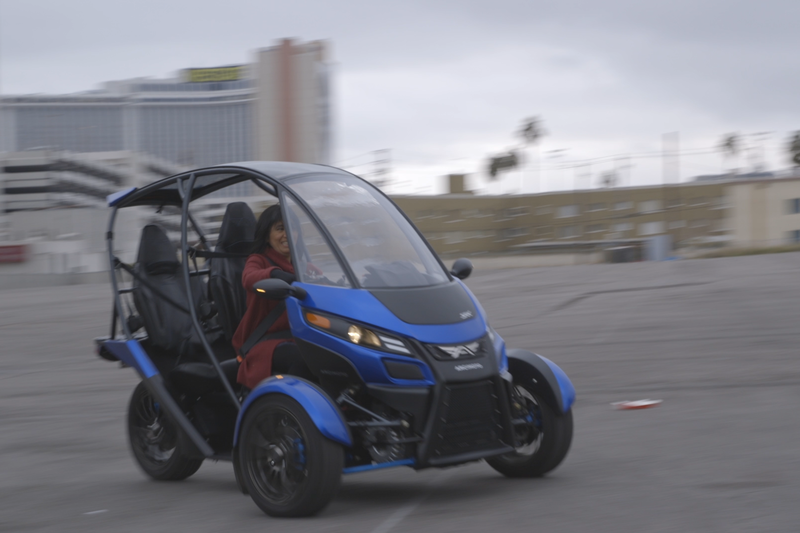 Arcimoto hates to admit it, but the motorcycle-like feel makes the SRK feel fun, not just practical.